For other uses, see Vedanta (disambiguation). Vedanta (IAST, Vedānta, Sanskrit: वेदांत) or Uttara Mīmāṃsā is one of the six orthodox (āstika) schools of Indian philosophy. The term "Vedanta" stands not for any one comprehensive doctrine but for the divergent philosophical views that developed on the basis of a common textual connection. This common texual connection is called the Prasthanatrayi, a collective term for the Principal Upanishads, the Brahma Sutras and the Bhagavad Gita. There are more than ten schools of Vedanta, including the better-known Advaita (non-dualism), Vishishtadvaita (qualified non-dualism), and Dvaita (dualism). Most other Vedantic traditions are subsumed under the term Bhedabheda (difference and non-difference) tradition. Over time, Vedanta adopted ideas from other orthodox (āstika) schools like Yoga and Nyaya, and, through this syncretism, became the most prominent school of Hinduism. Many extant forms of Vaishnavism, Shaivism and Shaktism have been significantly shaped and influenced by the doctrines of different schools of Vedanta. The word Vedanta literally means the end of the Vedas and originally referred to the Upanishads. Vedanta was concerned with the jñānakāṇḍa or Vedic knowledge part called the Upanishads. The denotation of Vedanta subsequently widened to include the various philosophical traditions based on to the Prasthanatrayi. These were the last literary products of the Vedic period. These mark the culmination of Vedic thought. These were taught and debated last, in the Brahmacharya (student) stage. The Upanishads, the Bhagavadgita and the Brahma Sutras constitute the basis of Vedanta. All schools of Vedanta propound their philosophy by interpreting these texts, collectively called the Prasthanatrayi, literally, three sources. The Upanishads,[note 2] or Śruti prasthāna; considered the Sruti (Vedic scriptures) foundation of Vedanta. The Brahma Sutras, or Nyaya prasthana / Yukti prasthana; considered the reason-based foundation of Vedanta. The Bhagavad Gita, or Smriti prasthāna; considered the Smriti (remembered tradition) foundation of Vedanta. The Brahma Sutras attempted to synthesize the teachings of the Upanishads. The diversity in the teaching of the Upanishads necessitated the systematization of these teachings. This was likely done in many ways in ancient India, but the only surviving version of this synthesis is the Brahma Sutras of Badarayana. All major Vedantic teachers, including Shankara, Bhaskara, Ramanuja, Nimbarka, Vallabha and Madhva, have composed commentaries not only on the Upanishads and Brahma Sutras, but also on the Bhagavad Gita. The Bhagavad Gita, due to its syncretism of Samkhya, Yoga, and Upanishadic thought, has played a major role in Vedantic thought. Bhedabheda, as early as the 7th century CE, or even the 4th century CE. Some scholars are inclined to consider it as a "tradition" rather than a school of Vedanta. The history of Vedanta is divided into two periods: one prior to the composition of the Brahma Sutras and the other encompassing the schools that developed after the Brahma Sutras were written. Little is known of schools of Vedanta existing before the composition of the Brahma Sutras (400–450 BCE). [note 5] It is clear that Badarayana, the writer of Brahma Sutras, was not the first person to systematize the teachings of the Upanishads, as he quotes six Vedantic teachers before him – Ashmarathya, Badari, Audulomi, Kashakrtsna, Karsnajini and Atreya. References to other early Vedanta teachers – Brahmadatta, Sundara, Pandaya, Tanka and Dravidacharya – are found in secondary literature of later periods. The works of these ancient teachers have not survived, but based on the quotes attributed to them in later literature, Sharma postulates that Ashmarathya and Audulomi were Bhedabheda scholars, Kashakrtsna and Brahmadatta were Advaita scholars, while Tanka and Dravidacharya were either Advaita or Vishistadvaita scholars. Badarayana summarized and interpreted teachings of the Upanishads in the Brahma Sutras, also called the Vedanta Sutra. [note 6] Badarayana summarized the teachings of the classical Upanishads[note 7] and refuted the rival philosophical schools in ancient India. The Brahma Sutras laid the basis for the development of Vedanta philosophy. Though attributed to Badarayana, the Brahma Sutras were likely composed by multiple authors over the course of hundreds of years. The estimates on when the Brahma Sutras were complete vary, with Nicholson in his 2013 review stating, that they were most likely compiled in the present form around 400–450 BCE. Isaeva suggests they were complete and in current form by 200 CE, while Nakamura states that "the great part of the Sutra must have been in existence much earlier than that." The book is composed of four chapters, each divided into four quarters or sections. These sutras attempt to synthesize the diverse teachings of the Upanishads. However, the cryptic nature of aphorisms of the Brahma Sutras have required exegetical commentaries. These commentaries have resulted in the formation of numerous Vedanta schools, each interpreting the texts in its own way and producing its own commentary. Little with specificity is known of the period between the Brahma Sutras (5th century BCE) and Adi Shankara (8th century CE). Only two writings of this period have survived: the Vākyapadīya, written by Bhartṛhari (second half 5th century), and the Kārikā written by Gaudapada (early 6th or 7th century CE). A noted scholar of this period was Bhartriprapancha. Bhartriprapancha maintained that the Brahman is one and there is unity, but that this unity has varieties. Scholars see Bhartriprapancha as an early philosopher in the line who teach the tenet of Bhedabheda. Gaudapada's Kārikā relied on the Mandukya, Brihadaranyaka and Chhandogya Upanishads. In the Kārikā, Advaita (non-dualism) is established on rational grounds (upapatti) independent of scriptural revelation; its arguments are devoid of all religious, mystical or scholastic elements. Scholars are divided on a possible influence of Buddhism on Gaudapada's philosophy. [note 10] The fact that Shankara, in addition to the Brahma Sutras, the principal Upanishads and the Bhagvad Gita, wrote an independent commentary on the Kārikā proves its importance in Vedāntic literature. A noted contemporary of Shankara was Mandan Mishra, who regarded Mimamsa and Vedanta as forming a single system and advocated their combination known as Karma-jnana-samuchchaya-vada. [note 13] The treatise on the differences between the Vedanta school and the Mimamsa school was a contribution of Adi Shankara. Advaita Vedanta rejects rituals in favor of renunciation, for example. Rāmānuja (1017–1137 CE) was the most influential philosopher in the Vishishtadvaita tradition. As the philosophical architect of Vishishtadvaita, he taught qualified non-dualism. 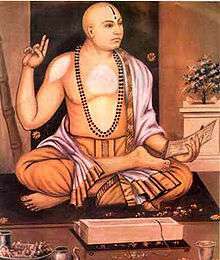 Ramanuja's teacher, Yadava Prakasha, followed the Advaita monastic tradition. Tradition has it that Ramanuja disagreed with Yadava and Advaita Vedanta, and instead followed Nathamuni and Yāmuna. 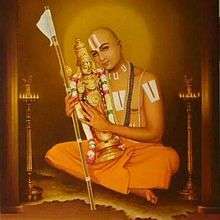 Ramanuja reconciled the Prasthanatrayi with the theism and philosophy of the Vaishnava Alvars poet-saints. Ramanujan wrote a number of influential texts, such as a bhasya on the Brahma Sutras and the Bhagavad Gita, all in Sanskrit. Ramanuja presented the epistemological and soteriological importance of bhakti, or the devotion to a personal God (Vishnu in Ramanuja's case) as a means to spiritual liberation. His theories assert that there exists a plurality and distinction between Atman (souls) and Brahman (metaphysical, ultimate reality), while he also affirmed that there is unity of all souls and that the individual soul has the potential to realize identity with the Brahman. Vishishtadvaiata provides the philosophical basis of Sri Vaishnavism. Ramanuja was influential in integrating Bhakti, the devotional worship, into Vedanta premises. Dvaita was propounded by Madhvacharya (1238–1317 CE). [note 14] He presented the opposite interpretation of Shankara in his Dvaita, or dualistic system. In contrast to Shankara's non-dualism and Ramanuja's qualified non-dualism, he championed unqualified dualism. Madhva wrote commentaries on the chief Upanishads, the Bhagavad Gita and the Brahma Sutra. Madhva started his Vedic studies at age seven, joined an Advaita Vedanta monastery in Dwarka (Gujarat), studied under guru Achyutrapreksha, frequently disagreed with him, left the Advaita monastery, and founded Dvaita. Madhva and his followers Jayatirtha and Vyasatirtha, were critical of all competing Hindu philosophies, Jainism and Buddhism, but particularly intense in their criticism of Advaita Vedanta and Adi Shankara. Advaita Vedanta (IAST Advaita Vedānta; Sanskrit: अद्वैत वेदान्त) espouses non-dualism and monism. Brahman is held to be the sole unchanging metaphysical reality and identical to Atman. The physical world, on the other hand, is always-changing empirical Maya. [note 15] The absolute and infinite Atman-Brahman is realized by a process of negating everything relative, finite, empirical and changing. The school accepts no duality, no limited individual souls (Atman / Jivatman), and no separate unlimited cosmic soul. All souls and existence across space and time is considered as the same oneness (i.e. monism). Spiritual liberation in Advaita is the full comprehension and realization of oneness, that one's unchanging Atman (soul) is the same as the Atman in everyone else, as well as being identical to the nirguna Brahman. Vishishtadvaita asserts that Jivatman (human souls) and Brahman (as Vishnu) are different, a difference that is never transcended. With this qualification, Ramanuja also affirmed monism by saying that there is unity of all souls and that the individual soul has the potential to realize identity with the Brahman. Vishishtadvaita, like Advaita, is a non-dualistic school of Vedanta in a qualified way, and both begin by assuming that all souls can hope for and achieve the state of blissful liberation. On the relation between the Brahman and the world of matter (Prakriti), Vishishtadvaita states both are two different absolutes, both metaphysically true and real, neither is false or illusive, and that saguna Brahman with attributes is also real. Ramanuja states that God, like man, has both soul and body, and the world of matter is the glory of God's body. The path to Brahman (Vishnu), according to Ramanuja, is devotion to godliness and constant remembrance of the beauty and love of the personal god (bhakti of saguna Brahman). Shuddhadvaita (pure non-dualism) states that the entire universe is real and is subtly Brahman only in the form of Krishna. He agreed with Advaita Vedanta's ontology, but emphasized that prakriti (empirical world, body) is not separate from the Brahman, but just another manifestation of the latter. Everything, everyone, everywhere—soul and body, living and non-living, jiva and matter—is the eternal Krishna. The way to Krishna, in this school, is bhakti. Vallabha opposed renunciation of monistic sannyasa as ineffective and advocates the path of devotion (bhakti) rather than knowledge (jnana). The goal of bhakti is to turn away from ego, self-centered-ness and deception, and to turn towards the eternal Krishna in everything continually offering freedom from samsara. This school is based on the premise of dualism. Atman (soul) and Brahman (as Vishnu) are understood as two completely different entities. Brahman is the creator of the universe, perfect in knowledge, perfect in knowing, perfect in its power, and distinct from souls, distinct from matter. [note 16] In Dvaita Vedanta, an individual soul must feel attraction, love, attachment and complete devotional surrender to Vishnu for salvation, and it is only His grace that leads to redemption and salvation. Madhva believed that some souls are eternally doomed and damned, a view not found in Advaita and Vishishtadvaita Vedanta. While the Vishishtadvaita Vedanta asserted "qualitative monism and quantitative pluralism of souls", Madhva asserted both "qualitative and quantitative pluralism of souls". Bhaskara, in postulating Upadhika, considers both identity and difference to be equally real. As the causal principle, Brahman is considered non-dual and formless pure being and intelligence. The same Brahman, manifest as events, becomes the world of plurality. Jīva is Brahman limited by the mind. Matter and its limitations are considered real, not a manifestation of ignorance. Bhaskara advocated bhakti as dhyana (meditation) directed toward the transcendental Brahman. He refuted the idea of Maya and denied the possibility of liberation in bodily existence. Chaitanya Mahaprabhu was the prime exponent of Achintya-Bheda-Bheda. In Sanskrit achintya means 'inconceivable'. Achintya-Bheda-Abheda represents the philosophy of "inconceivable difference in non-difference", in relation to the non-dual reality of Brahman-Atman which it calls (Krishna), svayam bhagavan. The notion of "inconceivability" (acintyatva) is used to reconcile apparently contradictory notions in Upanishadic teachings. This school asserts that Krishna is Bhagavan of the bhakti yogins, the Brahman of the jnana yogins, and has a divine potency that is inconceivable. He is all-pervading and thus in all parts of the universe (non-difference), yet he is inconceivably more (difference). This school is at the foundation of the Gaudiya Vaishnava religious tradition. To theorize that the soul (Ātman / Jivātman) and the physical universe (Prakriti) are both identical with and different from Brahman. This view is held by Bhartriprapancha. To place non-dualistic ideas in the most important place, relegating dualistic ideas to an interim position. This approach is followed by Shankara. To theorize that non-dualism is qualified by difference. This is Ramanuja's approach. To emphasize dualism, discrediting and offering an alternative explanation of non-dualistic ideas. This is from Madhva. Madhva said, "Man is the servant of God," and established his Dvaita philosophy. Ramanuja said, "Man is a ray or spark of God," and established his Visishtadvaita philosophy. Sankara said, "Man is identical with Brahman or the Eternal Soul," and established his Kevala Advaita philosophy. Brahman exists as the unchanging material cause and instrumental cause of the world. The Upanishads are a reliable source of knowledge (Sruti Śabda in Pramana); Vedanta is the pursuit of knowledge into the Brahman and the Ātman. Belief in rebirth and the desirability of release from the cycle of rebirths, (mokşa). The self (Ātman / Jivātman) is the agent of its own acts (karma) and the recipient of the consequences of these actions. Rejection of Buddhism and Jainism. Vedanta philosophies discuss three fundamental metaphysical categories and the relations between the three. Shankara, in formulating Advaita, talks of two conceptions of Brahman: the higher Brahman as undifferentiated Being, and a lower Brahman endowed with qualities as the creator of the universe. Parā or Higher Brahman: the undifferentiated, absolute, infinite, transcendental, supra-relational Brahman beyond all thought and speech is defined as parā Brahman, nirviśeṣa Brahman or nirguṇa Brahman and is the Absolute of metaphysics. Aparā or Lower Brahman: the Brahman with qualities defined as aparā Brahman or saguṇa Brahman. The saguṇa Brahman is endowed with attributes and represents the personal God of religion. Ramanuja, in formulating Vishishtadvaita Vedanta, rejects nirguṇa—that the undifferentiated Absolute is inconceivable—and adopts a theistic interpretation of the Upanishads, accepts Brahman as Ishvara, the personal God who is the seat of all auspicious attributes, as the One reality. The God of Vishishtadvaita is accessible to the devotee, yet remains the Absolute, with differentiated attributes. Madhva, in expounding Dvaita philosophy, maintains that Vishnu is the supreme God, thus identifying the Brahman, or absolute reality, of the Upanishads with a personal god, as Ramanuja had done before him. Nimbarka, in his dvaitadvata philosophy, accepted the Brahman both as nirguṇa and as saguṇa. Vallabha, in his shuddhadvaita philosophy, not only accepts the triple ontological essence of the Brahman, but also His manifestation as personal God (Ishvara), as matter and as individual souls. According to Advaita Vedanta, Ātman is identical with Brahman and there is no difference. According to Vishishtadvaita, Jīvātman is different from Ishvara, though eternally connected with Him as His mode. The oneness of the Supreme Reality is understood in the sense of an organic unity (vishistaikya). Brahman / Ishvara alone, as organically related to all Jīvātman and the material universe is the one Ultimate Reality. According to Dvaita, the Jīvātman is totally and always different from Brahman / Ishvara. According to Shuddhadvaita (pure monism), the Jīvātman and Brahman are identical; both, along with the changing empirically-observed universe being Krishna. 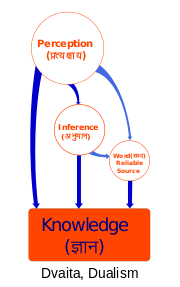 Epistemology in Dvaita and Vishishtadvaita Vedanta. Śabda (scriptural testimony/ verbal testimony of past or present reliable experts). The different schools of Vedanta have historically disagreed as to which of the six are epistemologically valid. For example, while Advaita Vedanta accepts all six pramanas, Vishishtadvaita and Dvaita accept only three pramanas (perception, inference and testimony). Advaita considers Pratyakṣa (perception) as the most reliable source of knowledge, and Śabda, the scriptural evidence, is considered secondary except for matters related to Brahman, where it is the only evidence. [note 19] In Vishistadvaita and Dvaita, Śabda, the scriptural testimony, is considered the most authentic means of knowledge instead. Vedanta, adopting ideas from other orthodox (āstika) schools, became the most prominent school of Hinduism. Vedanta traditions led to the development of many traditions in Hinduism. Sri Vaishnavism of south and southeastern India is based on Ramanuja's Vishishtadvaita Vedanta. Ramananda led to the Vaishnav Bhakti Movement in north, east, central and west India. This movement draws its philosophical and theistic basis from Vishishtadvaita. A large number of devotional Vaishnavism traditions of east India, north India (particularly the Braj region), west and central India are based on various sub-schools of Bhedabheda Vedanta. 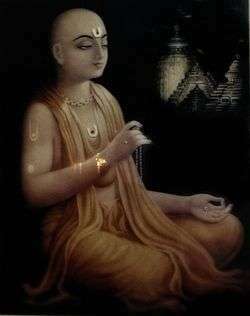 Advaita Vedanta influenced Krishna Vaishnavism in the northeastern state of Assam. The Madhva school of Vaishnavism found in coastal Karnataka is based on Dvaita Vedanta. Āgamas, the classical literature of Shaivism, though independent in origin, show Vedanta association and premises. Of the 92 Āgamas, ten are (dvaita) texts, eighteen (bhedabheda), and sixty-four (advaita) texts. While the Bhairava Shastras are monistic, Shiva Shastras are dualistic. Isaeva (1995, pp. 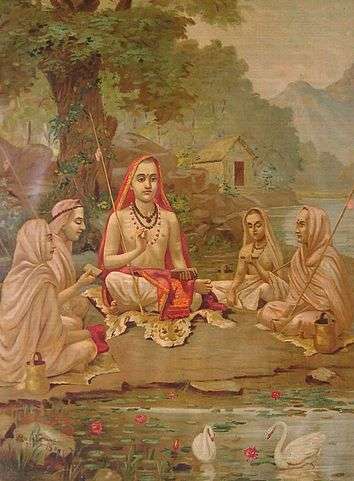 134–135) finds the link between Gaudapada's Advaita Vedanta and Kashmir Shaivism evident and natural. Tirumular, the Tamil Shaiva Siddhanta scholar, credited with creating "Vedanta–Siddhanta" (Advaita Vedanta and Shaiva Siddhanta synthesis), stated, "becoming Shiva is the goal of Vedanta and Siddhanta; all other goals are secondary to it and are vain." Shaktism, or traditions where a goddess is considered identical to Brahman, has similarly flowered from a syncretism of the monist premises of Advaita Vedanta and dualism premises of Samkhya–Yoga school of Hindu philosophy, sometimes referred to as Shaktadavaitavada (literally, the path of nondualistic Shakti). 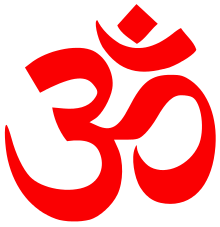 Neo-Vedanta, variously called as "Hindu modernism", "neo-Hinduism", and "neo-Advaita", is a term that denotes some novel interpretations of Hinduism that developed in the 19th century, presumably as a reaction to the colonial British rule. King (2002, pp. 129–135) writes that these notions accorded the Hindu nationalists an opportunity to attempt the construction of a nationalist ideology to help unite the Hindus to fight colonial oppression. Western orientalists, in their search for its "essence", attempted to formulate a notion of "Hinduism" based on a single interpretation of Vedanta as a unified body of religious praxis. This was contra-factual as, historically, Hinduism and Vedanta had always accepted a diversity of traditions. King (1999, pp. 133–136) asserts that the neo-Vedantic theory of "overarching tolerance and acceptance" was used by the Hindu reformers, together with the ideas of Universalism and Perennialism, to challenge the polemic dogmatism of Judaeo-Christian-Islamic missionaries against the Hindus. Ramakrishna, Vivekananda and Aurobindo have been labeled neo-Vedantists (the latter called it realistic Advaita), a view of Vedanta that rejects the Advaitins' idea that the world is illusory. As Aurobindo phrased it, philosophers need to move from 'universal illusionism' to 'universal realism', in the strict philosophical sense of assuming the world to be fully real. A major proponent in the popularization of this Universalist and Perennialist interpretation of Advaita Vedanta was Vivekananda, who played a major role in the revival of Hinduism. He was also instrumental in the spread of Advaita Vedanta to the West via the Vedanta Society, the international arm of the Ramakrishna Order. The so-called 'traditional' outlook is in fact a construction. Indian history shows that the tradition itself was self-conscious and critical of itself, sometimes overtly and sometimes covertly. It was never free from internal tensions due to the inequalities that persisted in a hierarchical society, nor was it without confrontation and challenge throughout its history. Hence Gandhi, Vivekananda and Tagore were not simply 'transplants from Western culture, products arising solely from confrontation with the west. ...It is rather odd that, although the early Indologists' romantic dream of discovering a pure (and probably primitive, according to some) form of Hinduism (or Buddhism as the case may be) now stands discredited in many quarters; concepts like neo-Hinduism are still bandied about as substantial ideas or faultless explanation tools by the Western 'analytic' historians as well as the West-inspired historians of India. An exchange of ideas has been taking place between the western world and Asia since the late 18th century as a result of colonization of parts of Asia by Western powers. This also influenced western religiosity. The first translation of Upanishads, published in two parts in 1801 and 1802, significantly influenced Arthur Schopenhauer, who called them the consolation of his life. He drew explicit parallels between his philosophy, as set out in The World as Will and Representation, and that of the Vedanta philosophy as described in the work of Sir William Jones. Early translations also appeared in other European languages. Influenced by Śaṅkara's concepts of Brahman (God) and māyā (illusion), Lucian Blaga often used the concepts marele anonim (the Great Anonymous) and cenzura transcendentă (the transcendental censorship) in his philosophy. The Vedanta contained in the Upanishads, then formulated in the Brahma Sutra, and finally commented and explained by Shankara, is an invaluable key for discovering the deepest meaning of all the religious doctrines and for realizing that the Sanatana Dharma secretly penetrates all the forms of traditional spirituality. ..the most influential school of theology in India has been Vedanta, exerting enormous influence on all religious traditions and becoming the central ideology of the Hindu renaissance in the nineteenth century. It has become the philosophical paradigm of Hinduism "par excellence". ... so exact a representation of the ideas of the Vedanta, that we might have suspected its founder to have borrowed the fundamental principles of his system from the Hindus, did his biography not satisfy us that he was wholly unacquainted with their doctrines [...] comparing the fundamental ideas of both we should have no difficulty in proving that, had Spinoza been a Hindu, his system would in all probability mark a last phase of the Vedanta philosophy. The Brahman, as conceived in the Upanishads and defined by Sankara, is clearly the same as Spinoza's 'Substantia'." As to Spinoza's Deity—natura naturans—conceived in his attributes simply and alone; and the same Deity—as natura naturata or as conceived in the endless series of modifications or correlations, the direct outflowing results from the properties of these attributes, it is the Vedantic Deity pure and simple. ↑ Historically, Vedanta has been called by various names. The early names were the Upanishadic ones (Aupanisada), the doctrine of the end of the Vedas (Vedanta-vada), the doctrine of Brahman (Brahma-vada), and the doctrine that Brahman is the cause (Brahma-karana-vada). ↑ The Upanishads were many in number and developed in the different schools at different times and places, some in the Vedic period and others in the medieval or modern era (the names of up to 112 Upanishads have been recorded). All major commentators have considered twelve to thirteen oldest of these texts as the Principal Upanishads and as the foundation of Vedanta. ↑ Sivananda also mentions Meykandar and the Shaiva Siddhanta philosophy. ↑ Proponents of other Vedantic schools continue to write and develop their ideas as well, although their works are not widely known outside of smaller circles of followers in India. ↑ Nicholson (2010, p. 26) considers the Brahma Sutras as a group of sutras composed by multiple authors over the course of hundreds of years. The precise date is disputed. Nicholson (2010, p. 26) estimates that the book was composed in its current form between 400 and 450 BCE. ↑ The Vedanta–sūtra are known by a variety of names, including (1) Brahma–sūtra, (2) Śārīraka–sutra, (3) Bādarāyaṇa–sūtra and (4) Uttara–mīmāṁsā. ↑ Bhartŗhari (c. 450–500), Upavarsa (c. 450–500), Bodhāyana (c. 500), Tanka (Brahmānandin) (c. 500–550), Dravida (c. 550), Bhartŗprapañca (c. 550), Śabarasvāmin (c. 550), Bhartŗmitra (c. 550–600), Śrivatsānka (c. 600), Sundarapāndya (c. 600), Brahmadatta (c. 600–700), Gaudapada (c. 640–690), Govinda (c. 670–720), Mandanamiśra (c. 670–750). ↑ There is ample evidence, however, to suggest that Advaita was a thriving tradition by the start of the common era or even before that. Shankara mentions 99 different predecessors of his Sampradaya. Scholarship since 1950 suggests that almost all Sannyasa Upanishads have a strong Advaita Vedanta outlook. Six Sannyasa Upanishads – Aruni, Kundika, Kathashruti, Paramahamsa, Jabala and Brahma – were composed before the 3rd Century CE, likely in the centuries before or after the start of the common era; the Asrama Upanishad is dated to the 3rd Century. The strong Advaita Vedanta views in these ancient Sannyasa Upanishads may be, states Patrick Olivelle, because major Hindu monasteries of this period belonged to the Advaita Vedanta tradition. ↑ Nicholson (2010, p. 27) writes: "The Brahmasutras themselves espouse the realist Parinamavada position, which appears to have been the view most common among early Vedantins." ↑ Shankara synthesized the Advaita–vāda which had previously existed before him, and, in this synthesis, became the restorer & defender of an ancient learning. He was an unequaled commentator, due to whose efforts and contributions, Advaita Vedanta assumed a dominant position within Indian philosophy. ↑ According to Mishra, the sutras, beginning with the first sutra of Jaimini and ending with the last sutra of Badarayana, form one compact shastra. ↑ Many sources date him to 1238–1317 period, but some place him over 1199–1278 CE. ↑ Doniger (1986, p. 119) says "that to say that the universe is an illusion (māyā) is not to say that it is unreal; it is to say, instead, that it is not what it seems to be, that it is something constantly being made. Maya not only deceives people about the things they think they know; more basically, it limits their knowledge." ↑ The concept of Brahman in Dvaita Vedanta is so similar to the monotheistic eternal God, that some early colonial–era Indologists such as George Abraham Grierson suggested Madhva was influenced by early Christians who migrated to India,  but later scholarship has rejected this theory. ↑ According to Nakamura and Dasgupta, the Brahmasutras reflect a Bhedabheda point of view, the most influential tradition of Vedanta before Shankara. Numerous Indologists, including Surendranath Dasgupta, Paul hacker, Hajime Nakamura, and Mysore Hiriyanna, have described Bhedabheda as the most influential school of Vedanta before Shankara. ↑ Anantanand Rambachan (1991, pp. xii–xiii) states, "According to these [widely represented contemporary] studies, Shankara only accorded a provisional validity to the knowledge gained by inquiry into the words of the Śruti (Vedas) and did not see the latter as the unique source (pramana) of Brahmajnana. The affirmations of the Śruti, it is argued, need to be verified and confirmed by the knowledge gained through direct experience (anubhava) and the authority of the Śruti, therefore, is only secondary." Sengaku Mayeda (2006, pp. 46–47) concurs, adding Shankara maintained the need for objectivity in the process of gaining knowledge (vastutantra), and considered subjective opinions (purushatantra) and injunctions in Śruti (codanatantra) as secondary. Mayeda cites Shankara's explicit statements emphasizing epistemology (pramana–janya) in section 1.18.133 of Upadesasahasri and section 1.1.4 of Brahmasutra–bhasya. ↑ Nicholson (2010, p. 27) writes of Advaita Vedantin position of cause and effect - Although Brahman seems to undergo a transformation, in fact no real change takes place. The myriad of beings are essentially unreal, as the only real being is Brahman, that ultimate reality which is unborn, unchanging, and entirely without parts. ↑ Vivekananda, clarifies Richard King, stated, "I am not a Buddhist, as you have heard, and yet I am"; but thereafter Vivekananda explained that "he cannot accept the Buddhist rejection of a self, but nevertheless honors the Buddha's compassion and attitude towards others". ↑ The tendency of "a blurring of philosophical distinctions" has also been noted by Burley. Lorenzen locates the origins of a distinct Hindu identity in the interaction between Muslims and Hindus, and a process of "mutual self-definition with a contrasting Muslim other", which started well before 1800. ↑ Raju 1972, pp. 176–177. ↑ Flood 1996, p. 231,232,238. ↑ Clooney 2000, pp. 147–158. ↑ Mohan Lal Sandal 1925, p. 16, Sutra 30. ↑ King 1995, p. 268 with note 2. ↑ Dasgupta 1922, pp. 28. 1 2 3 Hiriyanna 1948, pp. 19,21–25,150–152. ↑ Pasricha 2008, p. 95. ↑ Chatterjee & Dutta 1939, pp. 317–318. 1 2 3 Raju 1972, p. 177. ↑ Sivananda 1993, p. 216. 1 2 Sivananda 1993, p. 217. 1 2 3 Michael Comans 2000, p. 163. 1 2 3 4 5 Nicholson. 1 2 3 4 5 6 Nicholson 2010, p. 26. ↑ Sivananda 1993, p. 248. 1 2 3 4 5 6 7 Nakamura 1950, p. 3. ↑ Sharma 1996, pp. 124–125. ↑ Satischandra Chatterjee, Dhirendramohan Dutta (1939). AN INTRODUCTION TO INDIAN PHILOSOPHY. Rupa Publications India Pvt. Limited (2007 Reprint). p. 317. ISBN 978-81-291-1195-1. ↑ Sharma, Chandramohan (2009). A Critical Summary of Indian Philosophy. Delhi: Motilal Banarsidass. pp. 239–241. ISBN 978-81-208-0365-7. ↑ Pandey 2000, p. 4. ↑ "Indian Philosophy - Historical Development of Indian Philosophy | Britannica.com". 1 2 Nakamura 1949, p. 436. ↑ Nicholson 2013, p. 26, Quote: "From a historical perspective, the Brahmasutras are best understood as a group of sutras composed by multiple authors over the course of hundreds of years, most likely composed in its current form between 400 and 450 BCE.". ↑ Hiriyanna 1948, pp. 151–152. ↑ Nakamura 1950, p. 426. ↑ Hiriyanna, M. (1948). The Essentials of Indian Philosophy. Delhi: Motilal Banarsidass (2008 Reprint). pp. 19, 21–25, 150–152. ISBN 978-81-208-1330-4. ↑ Sharma 1960, p. 239. ↑ Olivelle 1992, pp. 17–18. 1 2 3 Nikhilananda 2008, pp. 203–206. 1 2 Nakamura 1950, p. 678. 1 2 3 Nakamura 1950, p. 679. 1 2 Sharma 1960, pp. 239–241,372–375. ↑ Raju 1972, p. 175-176. ↑ Carman 1994, pp. 82–87 with footnotes. ↑ Fowler 2002, p. 288. ↑ Jones & Ryan 2006, p. 266. ↑ Bernard 1947, pp. 9–12. ↑ Hiriyanna 1948, p. 187. ↑ Sheridan 1991, p. 117. ↑ Dehsen 1999, p. 118. ↑ Sharma 2000, pp. 79-80. 1 2 Sharma 1960, pp. 372–375. 1 2 Hiriyanna 1948, pp. 188–189. ↑ Sharma 2007, pp. 19–40,53–58,79–86. ↑ Schultz 1981, pp. 81–84. 1 2 3 4 Bryant 2007, pp. 479–481. ↑ Bryant 2007, pp. 479-481. ↑ Sharma 1962, pp. 353–354. ↑ Kulandran & Hendrik 2004, pp. 177–179. ↑ Sharma 1960, p. 374. ↑ Sharma 1960, p. 340. ↑ Mohanty & Wharton 2011. ↑ Sharma 1960, p. 376. ↑ Sivananda 1993, p. 247. 1 2 Bryant 2007, pp. 378–380. ↑ Gupta 2016, pp. 44–45. ↑ Sharma 1960, p. 346. ↑ Sharma 1962, pp. 368–374. ↑ Fowler 2002, pp. 34,66. 1 2 3 Doniger & Stefon 2015. ↑ Chari 1988, pp. 2,383. ↑ Vitsaxis 2009, pp. 100–101. ↑ Ādidevānanda 2014, pp. 9-10. ↑ Lochtefeld 2000, pp. 520–521. ↑ Grimes 2006, p. 238. ↑ Nicholson 2010, p. 27. ↑ Carman & Narayanan 1989, pp. 3–4. ↑ Neog 1980, pp. 243–244. ↑ Manninezhath 1993, pp. xv, 31. ↑ King 1999, pp. 187,135—142. ↑ King 2002, p. 118. ↑ King 1999, p. 137. ↑ Halbfass 2007, p. 307. ↑ King 1999, p. 138. ↑ King 1999, pp. 133–136. ↑ King 2002, pp. 135–142. ↑ Dense 1999, p. 191. ↑ Burley 2007, p. 34. ↑ Lorenzen 2006, p. 24–33. ↑ Lorenzen 2006, p. 27. ↑ Lorenzen 2006, p. 26–27. ↑ Renard 2010, pp. 177—178. ↑ Iţu, Mircia (2007), Marele Anonim şi cenzura transcendentă la Blaga. Brahman şi māyā la Śaṅkara, in Caiete critice 6–7 (236–237), Bucharest, ISSN|1220-6350, pp. 75–83. ↑ Literary Remains of the Late Professor Theodore Goldstucker, W. H. Allen, 1879. p32. Betty, Stafford (2010). "Dvaita, Advaita, and Viśiṣṭādvaita: Contrasting Views of Mokṣa". Asian Philosophy: an International Journal of the Philosophical Traditions of the East. 20 (2). Comans, Michael (1996). "Śankara and the Prasankhyanavada". Journal of Indian Philosophy. 24 (1). Gier, Nicholas F. (2012). "Overreaching to be different: A critique of Rajiv Malhotra's Being Different". International Journal of Hindu Studies. Springer Netherlands. 16 (3): 259–285. doi:10.1007/s11407-012-9127-x. ISSN 1022-4556. Nicholson, Andrew J. (2013). Unifying Hinduism: Philosophy and Identity in Indian Intellectual History. Columbia University Press. ISBN 978-0-231-14987-7. Puligandla, Ramakrishna (1997), Fundamentals of Indian Philosophy, New Delhi: D. K. Printworld (P) Ltd.
Sarma, Deepak (2000). "Is Jesus a Hindu? S.C. Vasu and Multiple Madhva Misrepresentations". Journal of Hindu-Christian Studies. 13. doi:10.7825/2164-6279.1228. Mohanty, Jitendra N.; Wharton, Michael (2011). "Indian philosophy - Historical development of Indian philosophy". www.britannica.com. Retrieved 26 August 2016. Buitenin, J.A.B. van (2010). "Ramanuja - Hindu theologian and philosopher". www.Britannica.com. Retrieved 26 August 2016. Doniger, Wendy; Stefon, Matt (2015). "Vedanta, Hindu Philosophy". Retrieved 30 August 2016. Britannica, The editors of Encylopaedia (2016). "Dvaita". Retrieved 31 August 2016. Jagannathan, Devanathan (2011). "Gaudapada". Internet Encyclopedia of Philosophy. Retrieved 29 August 2016. Stoker, Valerie (2011). "Madhva (1238-1317)". Internet Encyclopedia of Philosophy. Retrieved 2 February 2016. Ranganathan, Shyam. "Hindu Philosophy". Internet Encyclopedia of Philosophy. Retrieved 26 August 2016. Nicholson, Andrew J. "Bhedabheda Vedanta". Internet Encyclopedia of Philosophy. Retrieved 26 August 2016. The System of Vedanta by Paul Deussen. 1912. Reprint 2007. The Upanishads by Sri Aurobindo, Sri Aurobindo Ashram, Pondicherry, 1972.